It's a great live album from Visions of Atlantis. Formed in 2000, Visions of Atlantis have been through quite a few lineup changes over the years with drummer Thomas Caser being the only original member left in the band. Current vocalist Clementine Delauney is the band’s fifth female vocalist over the past 19 years, and having joined in 2013 is the second longest serving member of the band’s current lineup. Before joining Visions of Atlantis she sang with Whyzdom and Serenity. 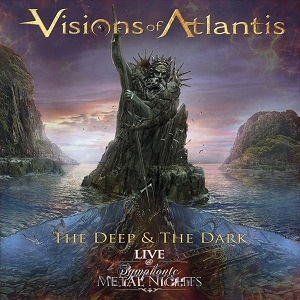 Now, 19 years into their career, Visions of Atlantis are releasing their first live album – “The Deep and The Dark Live at Symphonic metal nights”. It’s being released on Napalm records – not really a surprise given the fact that Thomas Caser is one of the top bosses at Napalm. The title of this release should give you an idea of what to expect from the setlist – it’s heavily based around the band’s 2018 album, “The deep and the dark”, with 8 of the 10 songs on the album making it into the set. While initially Visions of Atlantis relied too much on the Nightwish influence, they have over the years managed to build a more distinctive sound with their male and female vocal combination being a factor in building their own identity. They’ve got a strong catalogue of songs, and the latest studio album is a strong one which means that for this album they’ve got a great setlist. OK maybe one or two more older songs would have been nice to have, but it’s still a great setlist. The sound quality is excellent and there’s a good mix that ensures that not only are the vocals nice and prominent, but also the rest of the band are heard clearly too. Clementine’s vocals are excellent and she also does a good job of interacting with the crowd. It’s a great live album from Visions of Atlantis. Visions of Atlantis will be playing two UK dates in March supporting Kamelot.